Born in Ohio in 1949, the future cardinal grew up in suburban Pittsburgh. He attended a Catholic grade school with 1,600 students; at the age of 14, he entered the Bishop’s Latin School, a now defunct Jesuit-run pre-seminary high school. Upon graduation, he entered the Pittsburgh diocesan seminary and studied at Duquesne University. He earned a subsequent degree in sacred theology from the Pontifical Gregorian University and was ordained to the priesthood in 1977. After earning his licentiate in sacred theology in 1981, Father DiNardo returned to Pittsburgh, where the late Bishop Vincent Leonard appointed him assistant chancellor of the diocese and a part-time seminary professor. In 1984, he went back to Rome for a six-year stint as a staff member of the Congregation for Bishops. Father DiNardo did not desire to remain in the Roman Curia, according to Father Lou Vallone, a high school friend and Pittsburgh priest. “He never shirked what the Church asked of him, but never gave up his ideal of being a parish priest,” Father Vallone told CWR. “He requested to be brought back to Pittsburgh from his assignment at the Congregation of Bishops specifically to become a pastor. In 1994, Father DiNardo became founding pastor of a suburban parish. “He brought it from 600 families having Mass in an office building to 1,500 families with a temporary church, offices, classrooms, hall, and residence,” recalls Father Vallone. If Father DiNardo’s reputation as a pastor began to blossom in the suburbs of Pittsburgh, it came to full flower in northwestern Iowa. In 1997, Pope John Paul II appointed him coadjutor bishop of Sioux City, and the following year, he acceded to the see, succeeding Bishop Lawrence Soens. At his episcopal ordination, he invited Bishop Raymond Burke to join the bishops of Sioux City and Pittsburgh as a co-consecrator. Mother Kateri Marie of the Eucharist, prioress of Sioux City’s Discalced Carmelite monastery, recalls that on the day of the press conference announcing his appointment as coadjutor bishop, Father DiNardo asked if there were any contemplative orders in the diocese and visited the monastery on his way back to the airport. But Bishop DiNardo’s record there wasn’t flawless. In 2002, when clerical abuse scandals made headlines nationwide — in time, Bishop Soens would be accused of abuse — the Des Moines Register reported that a retired Sioux City priest who had been credibly accused of abuse had been saying daily Mass at the Sioux City cathedral. “In retrospect, as we look back, we would say that even that limited activity . . . is not indicated for someone who has abused minors,” Bishop DiNardo told the newspaper. “I can only say that it was wrong.” Bishop DiNardo permanently removed the priest from ministry. In early 2004, Pope John Paul appointed Bishop DiNardo coadjutor bishop of Galveston-Houston; he became coadjutor archbishop later in the year when Galveston-Houston was raised to the dignity of a metropolitan archdiocese. In 2006, he acceded to the see, succeeding Archbishop Joseph Fiorenza. In 1900 — when the five largest cities in the United States were New York, Chicago, Philadelphia, St. Louis, and Boston — Houston was a small city of 44,000. By 1990, it had become the nation’s fourth largest city, behind New York, Los Angeles, and Chicago. If Pittsburgh and Sioux City represent two strands of American Catholic culture that flourished in the past — one urban, the other rural, both influenced by European immigration — then Galveston-Houston represents the American Catholicism of the future. During his years in Galveston-Houston, “Cardinal DiNardo has placed emphasis on liturgy and catechesis, but that does not mean other areas are less important,” says Father Lawrence Jozwiak, rector of the Co-Cathedral of the Sacred Heart. He has stressed the importance of the Eucharist — the Mass — and other communal forms of worship: strong and effective preaching; good and appropriate music applicable to the Scriptures used; the importance of chanting; being faithful to the Church’s liturgical principles and guidelines, etc. Plus, Cardinal DiNardo emphasizes the importance of good catechesis: explaining effectively the Catholic faith and teachings and passing them on to all the people, whether young or older, knowledgeable or not so knowledgeable, Catholic or non-Catholic. In doing so, Cardinal DiNardo has led by example, says Dr. Dominic Aquila, vice president for academic affairs at the University of St. Thomas, a Basilian university whose fidelity to Ex Corde Ecclesiae has been praised by the Cardinal Newman Society. Msgr. William Stetson, a priest of Opus Dei who serves as secretary of the Pastoral Provision for the ordination of former Episcopal Church clergy, notes that Cardinal DiNardo has been very supportive of the local Anglican Use parish. Some cardinals make their influence felt through political statements; others, through bricks and mortar. 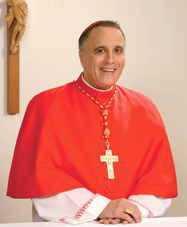 Cardinal DiNardo’s “personal investment” in others may be the means through he will exercise his greatest influence. “I have noticed personally the tremendous impact he has had in unifying the many cultural diversities of the archdiocese,” says local Catholic writer Vanessa Barnes, who was “most touched by the thoughtful compassion he showed” during recent hurricanes. Jeff Ziegler writes from North Carolina. The article originally appeared in the Catholic World Report print edition. Cardinal DiNardo has been very supportive of the local Anglican Use parish. It would be nice if he was also a little more supportive of the Tridentine Rite as well. I don’t get the sense that he is particularly against it, but I also don’t get the impression he is promoting it either. We still only have the one Tridentine Mass per week in downtown Houston. I am unaware of any others in the diocese. Makes it difficult to cram all one million Houston-Galveston Catholics in the Cathedral. However, not being an insider to chancery goings on, it may be the resistance is at the parish level, and he does not think it is worth the political capital to push for it. On the whole, he seems to be doing a decent job. My guess is that he’s so busy he can only utilize his time on certain things, hoping and praying the best for what he is unable to address such as making the Latin Mass more available. But I also agree with your assessment that there are some or many priests that refuse to celebrate the EF of the Latin Rite Mass. Ugh. Must we call it the “EF”? I prefer calling it the “Gregorian Rite Mass” myself, though not that many people may recognize it to mean the Extraordinary Form (EF) of the Latin Rite Mass. Traditional Latin Mass may be more accurate, but I hear people calling the OF Mass the “Latin Mass” when celebrated in the Latin language, which adds more confusion. Gregorian Rite Mass? A new Rite was not created. Extraordinary Form of the Latin Rite is most accurate. 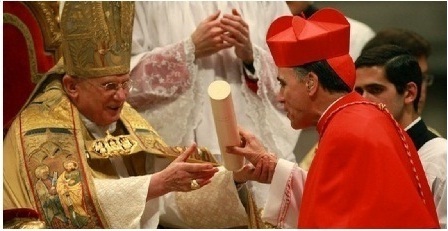 As a former Houstonian, I wish Cardinal DiNardo the very best. He has a large, multi-cultural, unruly flock to shepherd, much the same as Pope Benedict has. Certainly on the Cathedral, I think he did a fine job. We could have gotten an ugly monstrosity like they have in El Lay, but instead got a pretty nice one – it actually looks like a church rather than some government or multi-purpose building. Living in Houston, I can say the good cardinal was strangly silent about the Pro-choice advocacy of Barack Hussein Obama in the last presidental election. Actually, the co-cathedral is more retired Archbishop Fiorenza’s accomplishment than it is DiNardo’s. Strike my last comment, that was uncharitable of me.